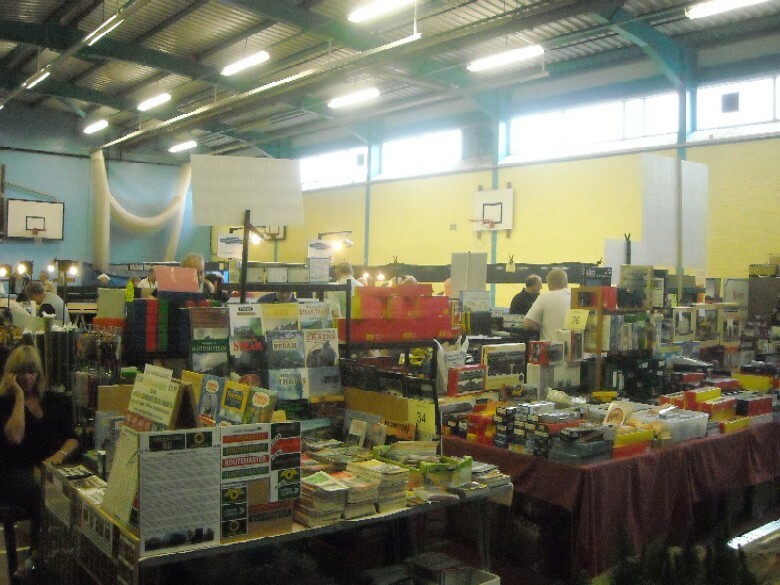 On Saturday 02 October and Sunday 03 October we held our 55th Annual Model Railway Exhibition, in celebration of the Ilford & West Essex Model Railway Club's 80th Anniversary. This special celebration event prompted at least sixty previous members of the club to be there in person; unfortunately some who came omitted to sign the commemorative visitors book. The earliest date noted was a junior membership in 1946. 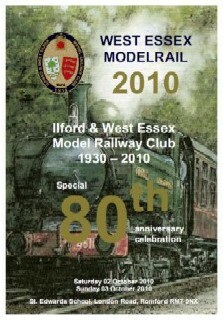 We also received an 80th birthday card and emails from well wishers, too numerous to answer individually. A tribute must be paid to the builders of 23 of some of the finest layouts seen at a local exhibition and the spread of interests we were able to display was remarkable. Even the trade response was equally encouraging with returns dates requested. One trader, very appropriately, suspended a large flying model of a spitfire from the ceiling over his stand. 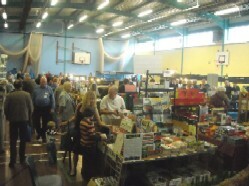 The enthusiastic atmosphere continued throughout the weekend, Sunday being nearly as busy as the Saturday. So that it was mid afternoon before we started to look at our watches contemplating the work still to be done on closure. 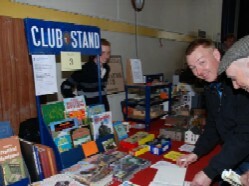 Prompted by the occasion, one unconnected visitor travelled from Portsmouth and stated it was one of the finest club exhibitions he had ever attended. 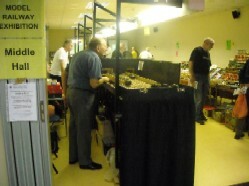 Thirty-five years ago, when the only other major exhibition was that of The Model Railway Club at the Central Halls, Westminster, the Ilford & West Essex Model Railway Club could expect to entertain 8,000 people at our own four day exhibition, Wednesday to Saturday, at the Ilford Town Hall. Those were the days! However, as our attendance was 25% higher this year, it seems there is a renewal to our hobby happening very slowly and the youngsters are beginning to find their way back into the only constructive hobby that can last a whole lifetime. At the Ilford Club we enjoy exceptional facilities that a visit to our website will reveal and guest and new members are always welcome. Our sincerest thanks to all who made this such a special occasion. A fictitious modern day seaside town whose main feature is a preserved tramway providing a public transport service along the busy seafront, all the way from the railway terminus to the fairground and depot. An attempt by the Southern Region to develop a seaside resort to rival Southend-on-Sea, but in Poole Harbour on the opposite side to Poole. The end result is a place you never want to go for a holiday! A convergence of two rural Hampshire branch lines in the 1960's, in the period just before dieselisation and the Beeching axe. 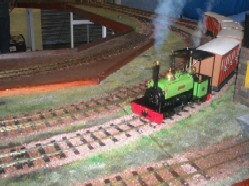 Featured in O Gauge Guild Gazette, Feb 2010. Blandford St. Mary, O Gauge. A small town in the south of England served by a through secondary line between the Somerset & Dorset and GWR. Its main industry, which dominates the town, is a brewery, and a small dairy complex is served via the engine shed track. A fictitious GWR seaside town located on the North Devon/Cornwall coast set between 1926-1934. Despite being a seaside town Dartley has a thriving market, which means that the yard can become extremely busy on market days. Representing the SNCF line from Chaumont to Culmont-Chalindrey, where the non-electrified main line from Paris to the Swiss border at Basel and the London-Calais-Dijon route are combined. Small layout set in rural Somerset depicting a remote farm, with accessible only via narrow lanes only passable by tractors. The landowner has a love of railways and has constructed a narrow gauge rail link to the local branch line and nearby market town. Granddad's Railway, Hornby 3 Rail. A nostalgic look back at those early days of model railways - Hornby Dublo Three Rail was introduced in 1938 to 1964, undoubtedly one of the finest model railway systems to evolve in the United Kingdom. Happisburgh Goods is the goods yard end of the much larger layout Happisburgh (pronounced Haysboro). The real town of Happisburgh on the north-east coast of Norfolk never got a railway because GER decided it would not pay, but this layout is based on the fiction that the proposed route eventually left the Norwich to Yarmouth line at Acle and ran up the coast through Horsey and Sea Palling to terminate at Happisburgh. With construction completed, we then imagine that another branch was built, curving northward to join the Cromer to Mundesley line at Paston. Hayesden, O Scale 16.5mm Gauge. Hayesden is an imaginary village in the Weald of Kent and we are eavesdropping on it on the snowy Monday morning before Christmas 1938, when the working week is getting going rather slowly. Like many narrow gauge railways, this one was built to link the communities along a river valley to the local market town. It was not absorbed into the Southern Railway in the 1923 Grouping but ekes out an independent existence with some signs of help from its larger neighbour. This fictional town is set in the foothills of the Rockies somewhere in Colorado in either the late 1960s or 1980-90s, the town growing up around the railway. The main operating companies are those that made up the Burlington Northern, however locomotives from Southern Pacific, Union Pacific and Santa Fe are also seen. Back by popular demand, the Kent Area 16mm Group with their live-steam and battery-powered locos on their massive 2-circuit layout with loco steam-up and preparation sidings and long passing loops. This is a small continuous-running layout comprising two figures-of-eight winding round a lake and through tunnels. Rolling stock is a mixture of steam and diesel, late 1950s to 1960s. Minic Motorways, Triang OO scale Road & Railway. A small town a few miles from the coast somewhere in the south of England, with a very old and worn out tram system. Having been in decline for some years, a visionary who saw the potential of redeveloping joined the company. By bringing in trams from around the world, renovating them and putting them into service (as had been done successfully in other countries) he suceeded in attracting visitors from around the country and abroad, increasing revenue and allowing for more trams to be purchased from places such as British Columbia, New York, Baltimore & Boston, Tokyo, Antwerp and St Petersburg, as well as our own British trams. This layout is set in the 1950s and assumes that the industrial lines on the Isle of Purbeck were extended to not only carry the ball clay but to include a passenger and local freight service. 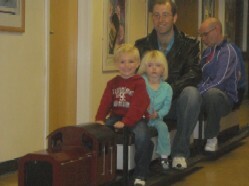 These trains run into a station located at Corfe. From the station a line extends through the Dorset countryside covered in the local gorse into the works of the Purbeck Clay Company. A busy (fictional) main line station with all types of streamline passenger services and both large and small freight trains passing through, plus the local shuttle passenger service providing a connection to the larger town several miles south of the main line. To the east are the mountainous regions of Whistling Woods with its busy logging industry, while to the west the landscape gives way to rolling hills as far as the eye can see. The layout was designed around our two main aims: to run long trains in the North American style, and to run plenty of them, continuously. Always movement on this layout! The period for the layout is the 1930's. The line to Simpson's Peak diverges from the main line just north of Durango on the D & RGW, and follows the course of the river Rio Florida to just below the foothills of Simpson's Peak. This line was never actually built, but the place is real, as is the river, so a little modeller's licence has been employed! A classic 'Beeching cut' layout, a terminus station housed in the remains of a much larger through station, on a now much shortened line. The one remaining platform is normally served by an hourly DMU service. However, the yard survived as a goods depot and departmental yard, resulting in regular freight trains. Stoney Lane Depot, N Gauge. Stoney Lane Depot is set in the Network Southeast era (1986-2000) and is located in South London around the Southwark area. Most of the buildings are based on real buildings from places around South London such as Battersea, Croydon, Surbiton, Borough, Stewarts Lane and Victoria. The main lines are on typical inner city viaducts that span the Thames flood plain as they reach the great Southern termini. Below them is a small depot and electric multiple unit stabling point loosely based on Stewarts Lane. Operations consist of typical electric commuter trains with cross-London freight making it a busy layout. Watney Street Goods & Westbridge Station,OO Gauge. A busy station and goods depot based in an inner city area. The line will probably soon come under the scrutiny of Dr Beeching. There are still quite a few passenger trains running in each direction, either into the 'City' or to the outer suburbs, so we are hoping that the line will survive. There are still plenty of goods trains that call to shunt some wagons in the small goods yard, deliver wagons and parcels stock to the Goods Depot. The large building on the right of the layout services goods wagons. 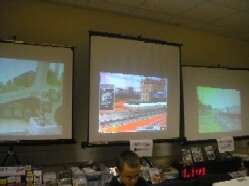 Finescale DCC 4mm exhibition layout set in the north-west in the mid-1980's. Although a fictional scene, the concept is based on a small fuelling point, shed and small P-way yard built to serve an off-scene marshalling yard for the Runcorn and Widnes industrial complexes including the ICI chemical works, and was inspired by visits to Warrington Bank Quay in the late 80s and 90s. Imagine a sleepy west country town - trains meandering their way through the countryside - that's Wouldham Town. The layout is based loosely on the type of trains that ran over the Somerset & Dorset line in the late 50s and early 60s before closure, and reflects the 'Slow & Dirty' image the line portrayed. Extensive range of lighting, unique scenery items & other accessories. A variety of useful tools and electrical components. The computer train simulation specialists.